The Andräkiche or Kirche St. Andrä is a neo-Gothic church on Mirabellplatz square, facing the palace of Mirabell. The Andräkirche is a plain building that normally does not attract an awful lot of attention from locals. It is at the heart of a district that was built after the destruction of the old city walls in this part of Salzburg - the neighbourhood is called Andräviertel. The entire area is dominated by Historicist or Gründerzeit buildings, a style that is typical for Vienna but rather unusual in Salzburg; it was developed in the very late 19th century. The original Andräkirche was a Gothic church at the Platzl square (the little piazza at the crossing of Linzergasse and Steingasse). It was modernised to Renaissance style under the rule of Prince Archbishop Wolf Dietrich von Raitenau around 1600; and upgraded again under Prince Archbishop Andreas Jakob Graf Dietrichstein to Baroque in 1750. In 1818, the great fire of Salzburg damaged the church very badly; after a long public debate, the foundations were demolished in 1861 - the main reason why the Platzl has its current (generous) dimensions. However, the locals lobbied for the construction of a new Kirche St. Andrä. 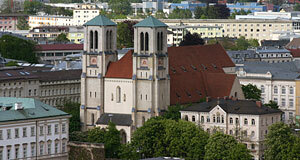 Since an entire new neighbourhood was developed at the site of former bastions, the construction of the new Andräkirche was started only a few hundred metres away from its original site. Alas, in a completely different style (or lack of style, that is): The new Andräkirche became a typical Historicist church of the sort that you can find in Vienna. The architect was Jakob Ceconi; the church came with 61 metre high towers and was consecrated in 1898. WWII led to serious damages for many buildings in Salzburg, including the Kirche St. Andrä. The church was restored more or less in the years after the war; however, this was only a provisory enterprise and in 1969, a major renovation had to take place. In the course of this effort, which took more than three years, the appearance of the church has been changed fundamentally: The pointy towers were equipped with shorter pyramid-shaped roofs, many of the ornaments on the outside façade were removed. The brick façade was covered with mortar and painted, which is general custom in Salzburg. The architects in charge were Clemens Holzmeister (a celebrity among Austria′s architects) and Franz Windhager. Their idea was to change the appearance of the Andräkirche to make it less "Viennese" - the way it was, it just didn′t fit into the surrounding architecture. We - the editorial team of Visit-Salzburg.net - think that this is quite a heroic deed; alas, it still doesn′t make the Andräkirche a particularly appealing building. More impressive is the Schranne, a farm market that takes place on Mirabellplatz right in front of the church every Thursday.